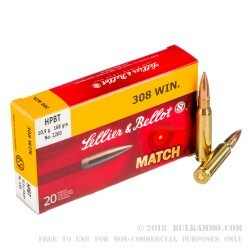 Precision and affordability come together in these .308 hollow point boattail rounds from Sellier and Bellot! Serious .308 shooters demand quality, but keeping those rifles fed can be quite costly. That’s no longer an issue with this Sellier and Bellot 168 grain hollow point boattail round. The hollow point design of the projectile gives the bullet better balance and a more consistent jacket, which results in better accuracy down range. Similarly, the boattail helps with aerodynamics. 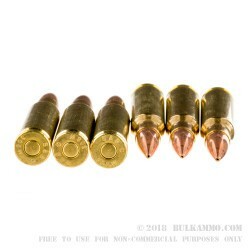 Sellier and Bellot, commonly known in the USA as S&B ammo, manufacture millions of rounds per year, including rounds for the military of the Czech Republic. Their reputation for reliability and quality is excellent, which means these .308 rounds will do exactly what they’re supposed to do. 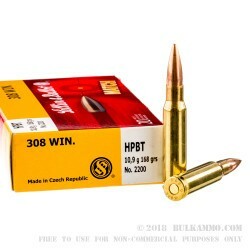 .308 is a popular caliber for hunting, and the hollow point on these .308 168 grain rounds will help with a clean kill, every hunter’s goal. 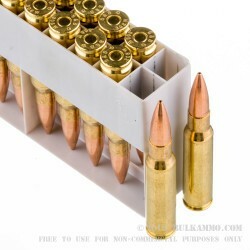 These rounds are loaded in new manufactured brass cases with non-corrosive primers, and come packaged in boxes of 20. Q: I need at least 2600fps with 168s to have less than a 20MOA drop at 600 yards. What is the muzzle velocity of this S&B ammo?